I read an article in the Sydney Morning Herald a few years ago. It basically said some online retailers were trying to charge different amounts for the same item depending on where you live. The theory was the suburb you live in dictates how much money you earn which in turn dictates how much you should pay for goods. (On a side note, if they are going to discriminate against where people live, can we talk about discriminating against size?? My size 5 feet and size I-J fingers require much less leather/gold than bigger sizes yet I pay the same price. I'm not saying we should start discriminating based on the size of an item but isn't discriminating against a consumer's postal code the same theory??). Anyway I found it absurd at the time and thought nothing of it again. Until today. 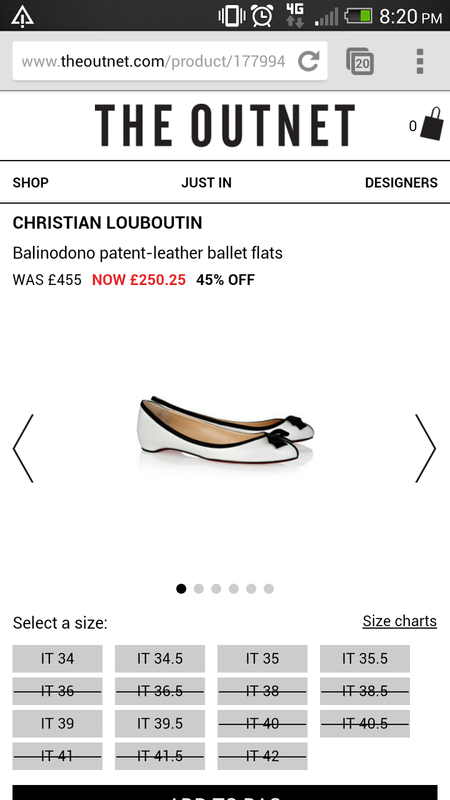 I was browsing the Louboutin sale on the Outnet on my phone last night (don't bother - not worth it). Then today I thought I'd have another look just in case they added more stock (wishful thinking, right?). 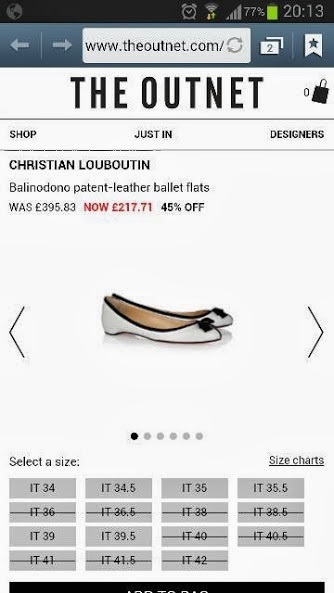 I saw a pair of flats for £217 which I could swear I had seen for £250 the night before. Clearly I've lost my mind and the lack of sleep is getting to me. Then tonight upon coming home to an empty apartment and wanting some retail therapy after an obscene day I decided to have ANOTHER look at the Outnet (obsessive!). Aaaand guess what - they were suddenly £250 again! 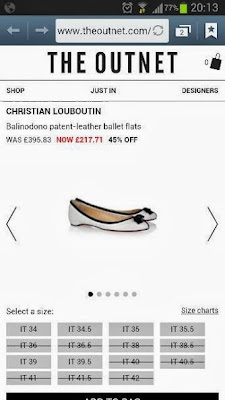 Not believing my eyes, I sent my sister the URL for the flats and asked her what price they were. £217 she says. Send me a screenshot I tell her. So here you go, my sister can buy these flats for £217 but I have to pay £250 for them. Have you experienced this before? Have I been paying more for months? Years??! You could trick them by getting it delivered to a low SES postcode via PO BOX? Or does it auto-detect your postcode? I use DoNotTrackMe in chrome so they can't see where I am. It auto-detects my location :( I'll look into DoNotTrackMe though, thanks for the tip!! I just searched too and the price was £218. I live in country Vic so I was hoping for a better price than that. Hehe. That is so weird. Hahaha if you got it for cheaper than £218 I would be getting you to receive all my parcels hehe!! yea that is weird. I know that is the case for petrol but have always thought that Groceries and retail goods within the same country should be the same pric Golly! Yeah how bizarre is it!! So bizarre, and how weird that people don't notice if they look at work and then home. And a huge difference! I know, right?? How many people check prices of an item from different locations? ?